Ray Moore assisted Phil Davis on the Mandrake the Magician comic strip a short periode before he, together with Lee Falk, created The Phantom in 1936. David Yearly Moore married Martha Stephens in 1898 and the first years they lived with David's family at Bedford Township, near Troy. David and Martha Moore moved to St. Louis before 1903 and had three children: Mary Adelia, Raymond Stepens[footnotes 1][footnotes 2] and David Yearly jr. In St. Louis David Y. Moore worked as a jeweler . After graduating Soldan High School , he enrolled in the law school at Washington University and played freshman football. But, as he expressed it: "I was kicked out after a year for arguing with a professor." In some years he drove a truck and worked on a street paving gang to earn money for an education. About this time he tried to get in the Air Corps, but failed to pass the written exam by 1.3 points . In 1927  he attended Washington University Art School in St. Louis and studied a year and a half  and then got a job as a commercial artist . He started to assist Phil Davis  (with some of the inking)  on the Mandrake strip. And when Lee Falk needed an illustrator for his new comic, The Phantom [footnotes 3], he asked Ray Moore to handle it. Ray Moore married Claire Lydia Moehlenbrock June 30, 1939 . About this time he also took up his interest in aviation and managed to get a private license and work for an instrument rating for cross-country trips. He bought a Monocoupe and operated out of Lambert - St. Louis Field in 1940 . Late 1942 Ray Moore began training as army instructor at Kelly Field , and soon he got the degree lieutenant at South Plains Army Air field . 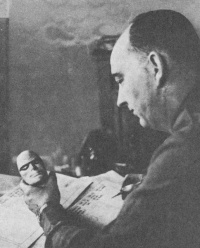 During his WW II duty something happened to Ray [footnotes 4], which made him unable to keep on drawing The Phantom and his assistant Wilson McCoy became the artist for the ongoing strips in 1947. In 1949 Ray and Claire bought a house on a remote hill in West County. Ray Moore died in 1984 of natural causes. He was survived by his wife, Claire, who passed away in 2005. Ray Moore's former house and studio off Barrett Station Road will be developed into a futher Missouri Dept. of Conservation area called "Phantom Forest". Ray said he usually worked in his shorts and that he often turned out three or four days work in a single night. He doesn't use models or any other artificial help, he just sits down an draws. Before the war he offered for publication a strip in which "The Phantom" played a part in war, the strip was refused at the time . ↑ Ray was born in Montgomery City where his grandparets lived, Dr. George W and Eliza A Stephens. ↑ Sometime one read that Ray's middle name S is Schettler, after his mothers family name. But Schettler are the family name of Alwin H Schettler who married Meta C Moehlenbrock, the sister of Ray's wife. ↑ Ray called his hero: "the guy in the long underwear" and Diana: "Pudding' Puss"
This page was last edited on 28 April 2018, at 19:44.